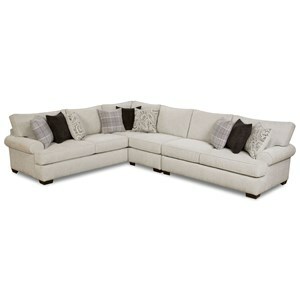 This sectional creates a plush, inviting sofa for your home with appealing contemporary style. 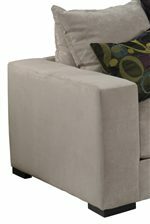 The sophisticated look combines timeless track arms with super plush cushioning in the seats as well as the loose back pillows to envelope you in comfort. The generous 116-inch width offers everyone plenty of room to spread out for in-home gatherings and general relaxing. With multiple fabric options available for the upholstery and the assortment of the back pillows, toss pillows, and the kidney pillows you can create a great look to your enjoy to share with family and friends in your home. The Lombardy Contemporary Sectional Sofa with Left Chaise by Jonathan Louis at Thornton Furniture in the Bowling Green, Alvaton, Glasgow, Scottsville, Franklin area. Product availability may vary. Contact us for the most current availability on this product. 332-82L LAF Chaise 1 45" 66" 25"
332-26R RAF Condo Sofa 1 71" 42" 25"
The Lombardy collection is a great option if you are looking for furniture in the Bowling Green, Alvaton, Glasgow, Scottsville, Franklin area. Browse other items in the Lombardy collection from Thornton Furniture in the Bowling Green, Alvaton, Glasgow, Scottsville, Franklin area.